New England Patriots: Was Julian Edelman’s Catch Better Than David Tyree’s? The New England Patriots were able to pull off one of the greatest comebacks in sports history in Super Bowl 51. An amazing catch by Julian Edelman played a big part in that. The New England Patriots did the impossible and overcame a 25-point deficit to defeat the Atlanta Falcons. Despite having a few chances to put the Patriots away, the Falcons left the door open for the comeback. As expected, a lot of things had to go right for New England. In the fourth quarter, the Patriots caught a lucky break. 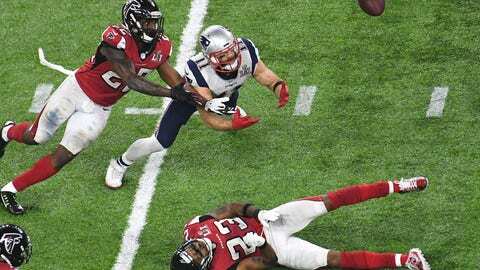 On a throw into tight coverage, wide receiver Julian Edelman was able to make one of the greatest catches in Super Bowl history. This wasn’t the first time that we have seen an amazing catch in a Super Bowl with the Patriots. In Super Bowl XLII, New York Giants wide receiver David Tyree made one of the best catches in Super Bowl history. With Eli Manning scrambling away from pass rushers, he chucked a ball down the field to Tyree. Despite great coverage, Tyree was able to use his head to secure the catch. Many have considered Tyree’s catch to be the best in Super Bowl history. However, Edelman’s catch is certainly able to challenge it. Both came at critical times for their team, and both eventually led to Super Bowl wins for their franchise. For fans of the Patriots, seeing their team be on the right side of a miracle catch was certainly a good thing. These two catches will surely go down as two of the best in Super Bowl history. We recently ran a poll on our Twitter account to see which catch that fans thought was better. As you can see, Tyree’s catch had a slight edge. This will surely be debated for years to come. Leave a comment below to let us know who you thought had the better catch!